Quite possibly the ultimate kitchen tool, you will wonder how you ever got along with out it. The V Slicer Plus is made in Germany with superior plastics, and surgical grade steel, so you know it's a durable and high quality device. Thanks to better materials and improved manufacturing, it will outperform others for ability and longevity. The six piece set featured here comes complete with the original Borner V-Slicer with ergonomic handle, two locking blade inserts (7mm for julienne and chopping & 3.5mm for julienne and dicing), an insert for thick and thin slicing, a safety food holder, and a space saving storage container. It can slice, dice, chop, julienne or shred any kind of fruit or vegetable. With this easy to use tool, you are guaranteed professional results every time. Just set it up for the type of cut you want, and then slide your food back and forth along the guide plate. Your fruits and vegetables will be uniformly sliced and chopped with speed and precision each and every time. The unique blade configuration reduces the effort required to cut, and the top quality steel ensures a razor sharp edge that stays that way, even with repeated use. It's dishwasher safe when dirty, and storage is safe and simple thanks to the included box that holds everything together. Top Quality. Because it's German made and constructed with better materials, it will be easier to use and longer lasting when compared to others. V-Shaped Blade. Incredibly sharp, but also positioned at the perfect angles. It reduces sticking and improves accuracy while making hard foods easier to slice. Quickly cut with little effort. Storage Container. Hang it on the wall, mount it inside a cabinet door or place it upright on the kitchen counter. Made of durable plastic, this storage device keeps everything together and out of the way. It holds all of the attachments, and keeps the blades covered for increased safety. When stored, everything compacts to 15" long, and 6" wide. Versatile. This one tool can take care of several jobs with speed and precision. Slice, dice, chop, shred, julienne and more. With a variety of attachments, switching tasks is simple. Safe. Although it couldn't get much sharper, it's safe to use thanks to the included food holder, and safe to store thanks to the container that hides blades when not in use. Want to spend less without giving up any features? 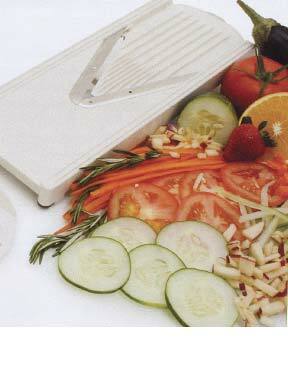 Check out our Deluxe Mandoline Slicer. It's not made in Germany, but it does offer good quality for a low price. Love the Borner brand, but want more bang for your buck? We have money saving combos that will save you cash while giving you extra stuff to make your slicer more useful. If this six piece set is not quite enough, check out our 7 piece set or 9 piece set for even more savings when buying this slicer. If you want a Borner slicer with an updated design, then take a look at the V-power. It is a newer version of this tool, and it comes in your choice of colors.Want to get the same slicer in a slightly different package? Check out the V-Prep 7 Piece Set. It's identical to this set, but it has a bowl and lid instead of the storage box. Cut thick pieces of apple for pies. Slice tomatoes for sandwiches and burgers. Cut potatoes thinly for homemade chips. Shred cabbage or lettuce for cole slaw and salads. Make vegetable sticks for a dip tray. Shred vegetables for a pasta alternative. Dice onions into perfect cubes. Prep layered casseroles and side dishes. Create chopped salads and beautiful garnishes. Stop slicing fruits and vegetables by hand. Do it faster, easier and safer with the V-Slicer. It's an inexpensive alternative to professional stainless steel mandolin slicers, but you will get near identical results. You'll be able to prep food faster, and create elegant meals in less time. Superior construction and specially designed, razor sharp blades make this tool easy to use and ensure it will last for years to come. With it's unique design, and multiple cutting inserts, you'll get perfect slices, uniform dices and perfectly shaped julienne sticks every time. Any fruit or vegetable is cut with little effort because the blade is so darn sharp. Soft stuff won't stick, and hard veggies won't refuse to move. Anything will glide right past, and cut without effort or frustration. The included food holder allows you to use every last piece of food, while keeping your fingers safe from harm. Slice onions, tomatoes, oranges, or chop french fries, carrot sticks, and cheese sticks. It shreds cabbage, neatly dices potatoes, cuts tomatoes without bruising or squishing and so much more. You could spend a whole lot more on a slicer that works this well, but you don't have to because this affordable alternative will outperform others in the same price range, because it produces results that rival units costing over $100. One of the best kitchen slicers available, and one of the easiest ways to get perfect results without any training or skill. Easily look like a professional chef while you save yourself tons of time an effort. Although anyone can use it without practice, following the steps below will ensure optimal performance. To use this tool, start by sliding one of the inserts into the notches on the plastic frame. It will lock into place with a click. The one with no blades acts as an adjustment for thickness, and either one with blades will allow you to cut vertically and horizontally at the same time for shredding, julienne and dicing. With one of the julienne inserts installed, the metal blades will face up and out. They cut food vertically, and the v-shaped, mandolin blade slices it down to size. 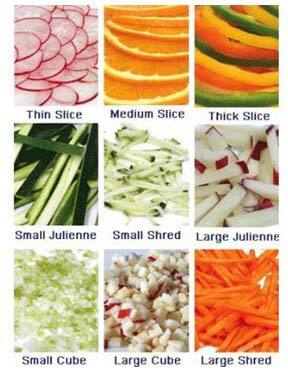 Select either size blade to julienne, chop and dice at your preferred thickness. You can adjust height by switching notches, and width by choosing a different blade. To julienne or shred, slide back and forth. To dice or cube, make a 90 degree rotation with each pass so that you are rocking back and forth. With neither julienne insert installed, you can cut normal slices. To adjust the slicing thickness, just add the insert, and flip to either side. One side will provide a standard thickness, and the other will give you thin pieces. Remove completely to get the thickest slices. To begin cutting, put your fruit or vegetable on the safety holder using the metal prongs, then slide the food back across the surface, and past the blade. Apply even pressure, and you will get perfectly uniform pieces, all the way down to the last bit. The blade is so sharp, that even hard fruits and veggies will be cut like a hot knife through butter. To store, add slicer to storage box, and slip blade inserts into position. It can be mounted to a surface, or it can stand freely. This would make the perfect addition to any kitchen, but for anyone that does a lot of food prep, this tool is a must have! This is the Original V-Slicer from Borner. We also carry the V-Power Mandoline which is the newer, upgraded model. This thing is absolutely top notch. No better product on the market in my opinion. If you want a clean and consistent look to your julienne or small dice and speed in doing so? Buy this product you will not regret it! I needed to replace my Borner V-Slicer Plus and was happy to find this site. Item was back-ordered but did arrive in a reasonable time frame. Just like my old one which was what I was looking for--slices well, cleans easily, price reasonable. I am very happy. Both items were as good or better than advertised. I too have owned a Borner V-Slicer Plus for almost 20 plus years. Never disappointed and easy to use. As far a being dishwasher safe, when I purchased mine I was told to rinse in hot/warm soapy water, rinse and done. When the white looks like it is not so white anymore I use a pan brush and soap and water and cleans up very well. Most of the time rinse, soap and water rinse and clean water rinse. That is it! Blades switch out very easily. Please be careful blades are very sharp and continue to never dull. Some days used more than once daily. Great for slicing cucumbers, zucchini, carrots etc. I can go on and on! Will not be disappointed with this purchase! Top shelf item. Order this brand only. The product was shipped and received in a timely manner. It's the same as the original slicer, which is what my Mother in Law was looking for. I have had a V-Slicer for years. I ordered this one as I gave my first one to my daughter. The new one is also a great product. I have never had any problems with either one. The first one I had for over 12 years and it still works like it did the first day I bought it. You will not be disappointed with this Slicer. I have tried others but nothing comes close to the quality of the Borner V-Slicer. Thanks for a great product!!! Awesome kitchen Vader. Love it. Perfect slices all the time. This is an awesome slicer. Switching blades is literally a "snap," and it slices like a breeze. I love Simplygoodstuff which is now my go-to place. Love it works so easy!!!!!!!! i hoped this slicer would be just what i needed to cut vegetables for soup. instead i have 40 dollars worth of plastic that is fair at best! Love this mandolin. Easy to set up, clean and store. Waited too long to get one. i like this product,, I would like it more if it was a bit more "heavy duty" electric.and assystem,, dial a cut.. I'm so in love with my new V-Slicer, because it cuts perfect and precise pieces every time I use it! I eat a lot of Vietnamese cuisines, which requires a lot of cabbage, onions, herbs, thinly Julianned apples and other veggies and fruits that would take forever if I cut them by hand. I'm never going without one again! I even bought one for my best friend. Delivery was fast and product arrived in excellent condition. I ordered 2 this time, I have been using this product for about 15 years. Love, love, love it. Once you use it, you want want anything else. I haven't received it yet, but I know I'll love it when I do. I'm replacing the one I now have. I use it practically every day and wash it in the dishwasher, so it's breaking in some places. I learned of this item from an America's Test Kitchen Review. They were very impressed with the slicer, it's now there go-to unit all over the kitchen. You can see them at the various cooking stations...and I'm equally pleased. This thing delivers. I've given it a 5 rating, but it's got one quirk, it's not very high over the sliced food.Feels odd to have to move the unit and move the product from under the unit so you don't have a mess on your hands. But, it's danged good...I've recommended it to several of my friends in the 1st month and a half of use. Borner V Slicer White with 3 attachments. The Borner V slicer is easy to clean, safe to use. I looked for the most professionally built mandolin on the market, and this is it. I have been preparing fruit and vegetables to be dehydrated and shredded cabbage for a salad. I like fine cut cabbage and lettuce. The thin slices are very nice. Dehydrated fruit and vegetables are very tasty and naturally preserved snack so thete is no guilt or feeling sick after eating them. I bought the Nesco Snackmacker along with this on another website for 75$ and it is quite. I dehydrate in my bedroom and it doesn't bother my room mates or me unlike the excalibur I bought for 150$ in 2009. It is FUN, SAFE EASY TO CLEAN. BUY IT!! Awesome product. Use it at our business. Will order other products soon. the product works just fine. makes preparing foods so much easier. thanks so much. ...if you don't get this! It's the greatest thing since sliced bread! Slices thick or thin, cuts food prep times 'way 'way down & is very easy to clean. It is truly a well made, well thought out essential piece of kitchen ware. My previous one called Miracle Chef Deluxe lasted close to 20 years. You'll be glad you bought this, you truly will. This slicer is a great time saver, easy to clean, and store in its own storage rack. Nice and sharp, but finger guard is awkward, the 2 slicing blades are quite limiting. The white plastic stained after my first sweet potato slicing. I prefer my adjustable single blade mandoline. This is my first mandolin type slicer purchase. I have been looking at various models for a while and based on the favorable review for the Swissmar Borner V-Slicer and the great price at Simplygoodstuff.com, I ordere it. It was delivered on time as promised with easy tracking. I was apprehensive of using the slicer due to the warnings about the sharp blades. They are sharp. But after a couple of practice runs, I am very compfortable using it with the protective cup. This slicer wokrs well for bigger vegetables like potatoes, onions, carrots, cabbage, tomatoes etc. Will not recommend it for smaller pieces like red radishes or cherry tomatoes. Shredded a whole head of cabbage in 30 seconds. There is very little waste and the last piece can be easily chopped up with a knife. The best thing about this machine is the ease of use and cleanup. This sits on the counter and is ready for used in a jiffy. The inserts are very easy to replace. With the thick/thin insert and the coarse and fine julienne inserts I have all my basic cuts covered. Cleanup is easy too with a rinse under running water. A good tool to have in the kitchen. I'm the wife, I got this last year for Christmas and it is great. It's easy to use and makes many kitchen jobs much easier. This one is for my sister-in-law, who incidentally is who purchased mine. She bought some other type at The Big E and asked for yours for a gift as the one she bought she said is horrible. I love mine as I'm sure she will. Love this tool. Wish I had purchased one years ago. Very easy to use, clean and store. I bought a borner v-slicer many years ago and used it for about 20 years. Finally had to throw it out because it was old. This new one is great. I sliced an eggplant for my eggplant parm in just seconds, each piece the same size, which made frying every slice done at the same time. So glad I found this product again! I HAVE OWNED THIS V SLICER FOR OVER 20 YEARS. IT STILL WORKS LIKE IT IS BRAND NEW. ABOUT 7 YEARS BACK, I PURCHASED A DIFFERENT BRAND AS A BACK UP BUT NEVER NEEDED IT. I WAS PLANNING ON GIVING IT TO A FRIEND SO I TOOK IT OUT OF THE BOX TO MAKE SURE SHE WOULD LIKE IT. IT HAD MANY PIECES AND IT LOOKED VERY COMPLICATED.SHE IS NOT A FAN OF COMPLICATED. MOST OF ALL, ONE OF THE PIECES COULD NOT BE ATTACHED TO THE MAIN UNIT. THE BORNER V SLICER IS SIMPLY THE BEST... I DECIDED TO JUST BUY HER BEST... THIS IS THE ONLY V SLICER THAT YOU WILL EVER NEED. I have had one of these for almost 20 years now and it is just as sharp and good as the day i bought it. I hate cutting and chopping by hand so I love this slicer. I can do a whole lot of slicing and chopping in a matter of seconds and clean up is a quick rinse in cold water! I love this slicer so much that I am purchasing this one for a friend that loves to cook. Good delivery time, tracking and follow up. I would definitely order from simplygoodstuff again!!! Such a wonderful kitchen tool! I love this Item. This is actually the second one that I have owned. Youor mandolins are great easy to use. Stays sharp a long time. These slicers were purchased for Xmas gifts. The parcel arrived in good time and the slicers look perfect. Thank you for the good experience with on line ordering. My first time. I would have been happier if I had recieved the free gift with all 3 slicers ,instead of just one 'cloth' with my order. I remember when the Borner V-Slicer was first introduced to the public some 20 or 30 years ago on an infomercial I saw on tv. I was quite impressed with it so I ordered one and had been using it ever since! unfortunately, my beloved V-slicer went missing during a recent move and I went on line in search of a suitable replacement. I was quite surprised when I found the exact same V-slicer offered by Simply Good Stuff and immediately ordered it. with the exception of some discoloration, my original one was in excellent shape...not even dull so I am hoping that this new one will be of the same quality and so far, it is living up to my original one's reputation! I love it! I bought this slicer years ago,wore it out, bought 2 different slicers to replace it. Threw both of them away and bought another v slicer. LOVE IT! It is worth every penny but be sure to use the hat or your fingers will suffer. I have yet to receive my slicer, but I know I will love it! I had one over 20 yrs. ago and don't know what possessed me to get rid of it. It has been shipped and will be getting it today or tomarrow. I really am excited at the thought of having this tool in my kitchen again. It is going to be wonderful for the dehydrating that I do. So so quick! And best of all, easy peasy clean up! Dicing is easy. Follow these steps for quick results that look perfect. Choose one of the two julienne blades, and install in the slicer. The size of the pieces will be uniform cubes in one of two sizes. For more size options, check out the extra blades we carry. Place your vegetable in the food holder by using the metal prongs. Regular up and down slicing will produce long sticks. To dice your food, simply turn 90 degrees with each pass. Slice up and down, and rock back and forth to dice food quickly. Begin with the veggie recessed in the holder. Use the top plunger to reveal , little by little, and use every last bit. The first pass will cut vertically, the second one will slice perpendicular because it was turned, and as you slide down, the v-blade will cut off perfect cubes. Continue turning back and forth while slicing up and down until you have a pile of chopped food underneath the slicer. I need to replace the basic insert that makes thick and thin slices. Can you advise me as to where I could get them? This is not a part we are able to order and keep in stock. We may have one available though, and if we did, we would sell it to you for a low price. Please give us a quick ca,, and someone would be happy to check inventory in the warehouse for you. The other option would be to contact the manufacturer directly. I'm interested in Swissmar Borner vplus and on YouTube video the lady has one with foldable legs. But I can not find it on Amazon or anywhere else! Am I dreaming? Can someone tell me if that model exist ??? The Borner does not have legs. You can get the bowl, and it will mount to that to serve the same purpose, but only other brands have fold-able legs. will i be able to slice whole potato to make scalloped potato? Absolutely! It's perfect for that, and plenty wide enough for any kind of potato. I need a storage multi box part # Art.-Nr. 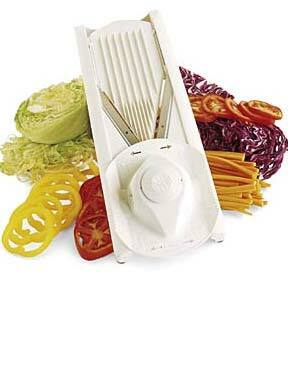 :3h for the original Borner V slicer where can I get it? This is not a standard replacement part, but we do have some available from time to time. Please give us a call to check current inventory and place your order over the phone. Are the blades on the V- slicer body engraved with "Made in Germany" and "Borner"? Yes. The V-blade is marked "Borner" on one side, and "Made in Germany" on the other. Where can I purchase a -- Borner V-Slicer Plus (6 piece set) In Ontario, Canada? We are not aware of any local outlet in your area, but we do ship to your country, so you may want to consider ordering one from us to bring your search to an end. Where or how can I get detailled instructions in English, not German? English instructions are included with each set. 0 of 5 Customer(s) found this Answer helpful. how do you mount the multi box to a cabinet? There are holes on one side that will allow you to mount it with screws. The hardware is not included though. 0 of 4 Customer(s) found this Answer helpful. Is the Borner V-Slicer dishwasher safe? Yes it is. Hand washing is recommended, but you can clean it on the top rack of your dishwasher too. Will the swissmar border v-slicer julienne carrots? Or are carrots too hard? Yes. It works well with carrots. I want to purchase a Vorner B-slicer Plus. In addition I want a second multi box holder for a friend.What would be the additional cost? For help with extra parts and current availability and pricing, please give us a call. How do I mount the slicer on a cabinet for storage? The storage caddy has screw holes for mounting to a cabinet or wall. It does not come with the hardware, so you will need to supply your own screws. What type of plastic is this made from? Is it BPA-free? Hello. 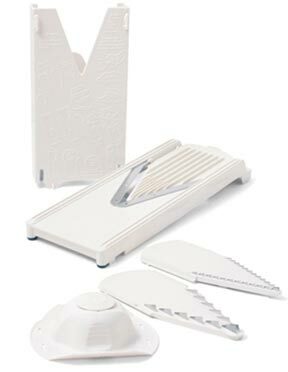 I need to replace the basic insert of the original v-slicer that makes thick and thin slices (no blade). Do you sell this part? Thank you. For assistance with replacement parts and current availability, please give us a call. A Money Saving Package. Get 4 Products For One Low Price. A Conveniently Compact Food Slicer.